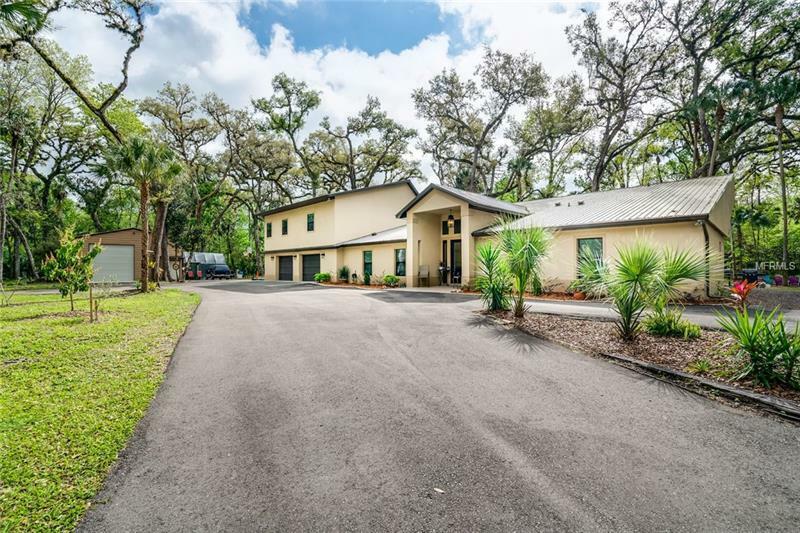 Auto Enthusiast and Animal Lover's dream estate on secluded 5.2 wooded acres. The home was fully upgraded in 2014/15 including flooring plumbing electrics metal roof and many other significant improvements giving this home an EFFECTIVE AGE of 2014. PLEASE SEE ALL ATTACHED SUPPORTING DOCUMENTS. Upon entering you feel the inviting warmth and a sense of home with high ceilings and windows with Frank Lloyd Wright style in the foyer and kitchen. Open and bright kitchen with island and coffee bar granite counter tops with solid wood cabinets large closet pantry and stainless-steel double oven and 2 refrigerators. Three master suites two on the first floor. Oak stairs lead to the flexible master retreat or apartment with a private screened balcony and pre-designed capability for a kitchenette. New 1200 sq ft automotive shop/barn with bathroom A/C clean room 2 - 12 ft roll-up doors 10000 lbs 2-post automotive lift air compressor and a 30kw whole house diesel generator wired for home and shop. Outside you will find two zip lines and a well-worn go-kart path for your younger friends a fire pit 6-person hot tub and shooting berm for your older friends. Double entry blacktopped drive is fenced and gated. The community allows for a 2nd residence to be built on the property. Roads paved and gated. Easy access to Hwy 429 and I-4. HOA only $200 annually. Call today for a complete list of features and what has recently been added to the property.